I'm glad I did, there I was trying to fit it into a 1*4U space and now I can safely go for a 2*5 knowing it will fit into other modular racks. Are all modulars 5U high? If not, is it still an option for other, non MOTM, racks? No, not all modulars are 5U high. MOTM and Synthesizers.com are 5U, but all FracRak modulars (Paia, Blacet, Wiard, Metalbox, new FracRak MOTM modules) are 3U high. The Blacet version of the rack is of much better build quality than the Paia (I own and have constructed some of each, and the Blacet ones are MUCH better... totally worth the money). Paia invented the "Rack". We engineered a slightly different version to meet our quality and delivery needs. Modules from Paia, Blacet and some of Wiard's will fit in either rack. A typical front panel drawing is shown below for making compatible DIY modules. Note that the maximum PCB height is 4.22" to allow clearing the Blacet Rack mounting rails. Have I answerer all of your questions? BigTex: Sorry, didn't mean to take over your thread. How is the Blacet work coming? I just ordered VCO 3 and VCO 4, for mine, so I'll be building again soon. My Bananalogue Serge VCS module just showed up today as well. Just switched over to a new power supply too. Got a Power One 3 amp supply. The thing weighs more than everything else in the rack combined. No prob. Fascinating stuff, and perhaps you should start a new thread to continue the discussion of it. I for one would love to see a higher resolution wavetable module! I keep thinking about eventually making a module of some sort using an Atmel AVR chip. As far as my Blacet work, I'm on my last day of a long road trip, and I'll get back into the Blacet in the coming week. Hi Big TEX !! Hope your trip was good. We kept the thread fairly busy when you were gone! Welcome home! 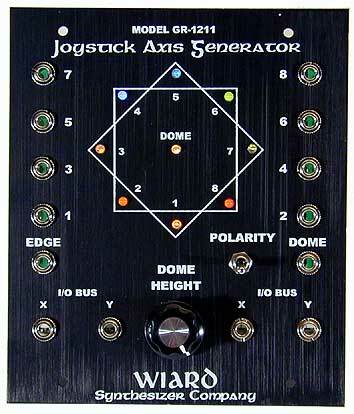 Hey, just wanted to tell you, I just purchased this little beauty from Wiard Synthesizer!! And the Joystick also. SEE PICTURE ... Frac-Rack compatable. Will work it with my Blacet modules and my "Versatile Envelope Generator and VCA Module"
I'm home (well, at work...) safe and sound. Great trip, lots of fun. Nearly 3500 miles of driving over 9 days. Phew! Last night I wired up the front panels for the remaining VCAs, so tonight I'm going to finish the mixer/processor and make some more patch cables. At that point, I think I'll take those first two racks home (finally) and do some *real* recording with the rest of the gear back in my home studio. The next two weeks will be all about finishing off the other two racks. Here's hoping I can finish it that quick. I want to get this stuff done! That is quite possibly my next Wiard purchase. (I already have the Joystick module.) Just received my NoiseRing yesterday. It's quite possibly my favorite module at the moment. I may want another one, so I can use one as an audio source, and the other as a CV source simultaneously. I've gotten some insane rythmic sounds when controlling the MiniWave with it. Yes, JAG really caught my eye. I originally saw a bit about it in an article in "Electronic Musician" several weeks ago and was impressed with it. I will report on it once I get it. Grant says he has several built and can deliver it within his usual time frame for deliveries. I went for the black face to match my Blacet modules. I saw the NoiseRing in the gear review on our EM-home page. I checked out the samples on Wiard's web page and like it. The chance variability seems like a great idea. If I like the quality of the JAG, I may try that NR myself. 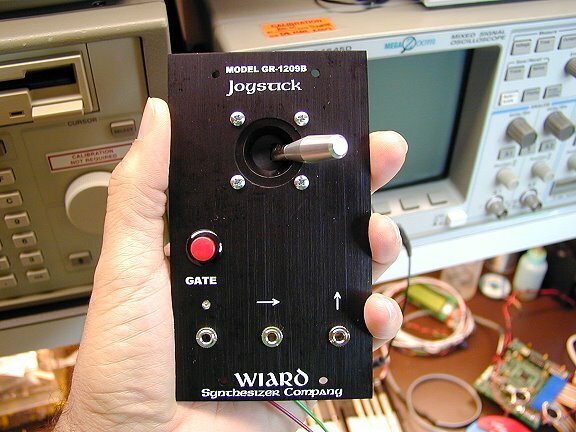 Got my Wiard JAG. Just realized my Frac Racks are full !! Now I have to get another from either Blacet or PAIA. One of the pictures is of the component board on the Axis Generator module. The soldering on the SMT components is OK but I have seen better. It may not be a fair assament though as I work in a facility where MIL standard soldering is the norm. The quality of the front panel and electronic components seem very good. This unit will come in handy and has LOTS of creative possibilities. The joystick movement feels real nice and does not feel cheap. The stick itself is metal and not plastic and will not break so easily. Especially important of you move the gear around lots. Seems worth the money. Once I get the stuff mounted, I can play a bit and let you know more! The last picture is the main processor board of a new design of mine. Its an 8 channel complex modulation generator with 8 additional high performance VCA channels (>100 dB attenuation range). 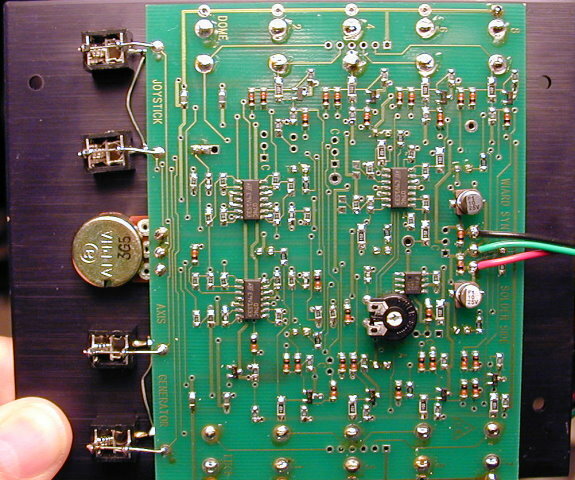 This board contains the microcontroller, MIDI interface, and MULTI-DAC/CPLD interface. There will be three circuit boards in total and a small graphic LCD display. This is the prototype and everything will be committed to surface mount printed circuit cards when everything is working well enough. I wanted to design the boards as generic as possible for reuse in other design configurations. 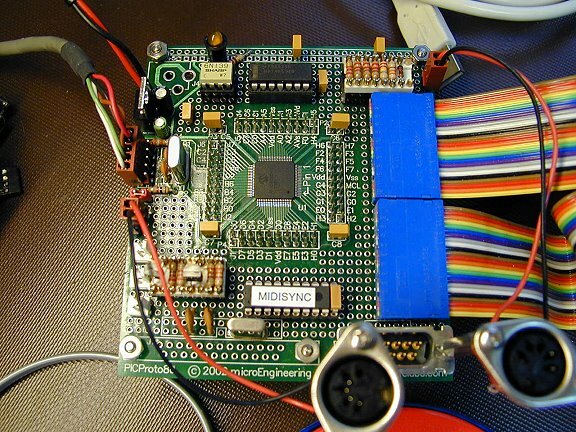 An example would be a general purpose 8 channel VCA board, Multi-DAC board, FPGA board. Chat soon .... Let us know how your Blacet system is coming along! One of the pictures is of the component board on the Axis Generator module. The soldering on the SMT components is OK but I have seen better. It may not be a fair accesment though as I work in a facility where MIL standard soldering is the norm. Can't wait to hear what you do with the new toys. That sounds great. That will offer a lot of flexibility for such a small module. Analog and digital: so happy together. Are those MIDI jacks bolted to the screw holes on a DB9 connector? Reminds me of the time I had to replace the voltage regulators on a whole slew of microcontroller development boards destined for classroom use. Just to make them more robust, I replaced the tiny regulators with TO-220 ones, and bolted their heatsink tab to the unused DB9 connector. Heat, heat, go away! Let us know how your Blacet system is coming along! Well... I've had some house guests for the last week, and I'm working crazy overtime to boot, so I haven't really gotten much more done This has been a very busy summer for me... but I'm hoping to get back to my last two racks soon. I've got the two completed racks with the VCOs and amps at home now, so I've started incorporating it into the rest of my studio (which I should post some pictures of). Anyway, nothing much to report now, but soon (I hope). Coming (less) soon: 16 step sequencer with two independantly clocked step groups in a single 3" blacet module (blinky lights included!). I can't wait to take this design from paper to reality. Yes, with a little thought and proper layout, they can be happy together. Are those MIDI jacks bolted to the screw holes on a DB9 connector? Inprovisation going on there. When I develop and debug MIDI applications, I like to use the MIDI (through/out) output from the target board under development and send that to a computer running MIDI-OX and a Midiman 2x2 MIDI interface. It really works very well as a MIDI protocol analyzer among a bunch of other things as described below. I am not sure how much you are into MIDI. "MIDI-OX is a multi-purpose tool: it is both a diagnostic tool and a System Exclusive librarian. It can perform filtering and mapping of MIDI data streams. It displays incoming MIDI streams, and passes the data to a MIDI output driver or the MIDI Mapper. You can generate MIDI data using the computer keyboard or the built-in control panel. You can even record and log MIDI data and then convert it to a Standard MIDI File for playback by a sequencer"
A big bottle of "Jim Beam" will take care of that!!! DUDE !! I am 44 now and to keep my hands steady, I drink an 8 OZ. glass of Duck Walk Blush before any solder session! (Only on weekends though - he he)Works wonders for my music to Actually, what keeps me young is interacting with people of all ages. I seem to relate, thank god !!! Sounds like you a busy guy! Don't worry, there will always time to finish. Well, you got the two racks home in your studio? Good! Pictures of our studio would be nice. I will post some soon new ones myself. I would like to post some new topics on "workflow" and the various music styles that people are doing. Sounds like a nice project. I would like to hear some of your thoughts on that design. Bill writes really good music. I'm sure it will be great. Thank you Howard I hold your opinion in high regard !! Oh, BTW, I really like the "Xeriod Entity Live at the Deer Head Inn"! I bought the CD at EM06. Great driving music to. Really thought provoking music. I can't really explain it but lots of certain types of electronic music stimulates certain brain waves in me, and probably in many others also. Electronic music actually enhances my thought process and I tend to study very well when listening. I think there should be a formal paper written or study on the subject. I should do a search on this subject. Sounds like another topic for discussion. You MAD bender you!! Very cool! I love the commentary, very funny! I had the very same Yamaha Keytar about 13 years ago!! I have a sick story that is associated with that Yamaha unit. I had a really wacky girlfriend at that time who went "postal" on me, and got tired of my experimenting on the thing and proceeded to tug it from my hands, and smashed it up against the wall into a pile of cracked plastic and circuit boards. Now thats circuit bent!! (THAT ACTUALLY IS A VERY TRUE STORY). My current partner is very good, gentle, and tolerates all my obsessive behaviors and interests. OK, I guess I have to go back to rehab now! See you all in a few years! Hey TEX, very good man! A messy studio is a studio thats worked in! I mean that in a GOOD way my friend. Right ON !! I guess I will have to get with the picture taking. You MAD bender you!! Very cool! I love the commentary, very funny! I had the very same Yamaha Keytar about 13 years ago!! The sick thing about a story associated with that unit is that I had a really wacky girlfriend at that time who went "postal" on me, got tired of my experimenting on the thing and proceeded to tug it from my hands, and smashed it up against the wall. Now thats circuit bent!! (THAT ACTUALLY IS A VERY TRUE STORY). My current partner is very good and tolerates all my obsessive behaviors. Yikes. Good riddance! My girlfriend may not like the noises I make, but she knows that I'm a better person for doing it. We're pretty good about not stifling each others' creativity, even if we don't always share interest in something. It works rather well, actually. Did the keyboard survive? There are some wicked bends in there! GASP! I need to get out more - I didn't even know this thread existed. Mmmbut I do have a Miniwave kit waiting in the wings. Well.. nothing wrong with doing your own thing I think the stuff you've made on your own is really amazing. Of course I'm proud of my Blacet system, but I hope to have the time, space, resources and ideas to do much more DIY stuff in the future. I think my four racks of Blacet stuff will be only the beginning. Oh, right... samples. I've recorded quite a bit more that I need to post. I still haven't built the other two racks of stuff. Life just gets in the way sometimes.... sooo busy lately. RRrrrrr. I need to build more patch cables, too. I only have about 10 right now, and that's just not enough! Anyway, thanks for noticing and for the kind words. Speaking of MultiPhase, it's been a bit ravaged by the events of this summer - only a breadboard and a half of it is intact, as the Thomas Henry circuits have encroached. Anyway, cool story - last night, out of the blue, my la-bohr-atory assistant, Matthew, came in carrying this huge box. He said I was going to be very surprised. I looked at the return address - it was from North Mankato, MN. I emailed Thomas, thanking him, and he said that he was cleaning out his shop and figured instead of throwing these things out, he'd send them to me. It was my choice if they wound up on the Mount Hope refuse pile or not (as if). The phase shifter is a design that Thomas worked on with Mark Amundson, but they discarded it as an idea for a MAP module - it was becoming too complex (an easy thing to have happen, as I've figured out). Anyway, I haven't fired it up to see if it works yet, Thomas thinks it may still work. The other thing, the VCD, is a SAD4096 based voltage controlled delay. I did fire that up - it wasn't working too hot. A bit farty and noisy and in general ill health. I could hear the BBD did have an effect. Thomas says it could be the SAD4096 has fizzled, but I'm counting the seconds I can go home and investigate. If it is the SAD4096, there's no hope of replacement, but there are other things I can do.